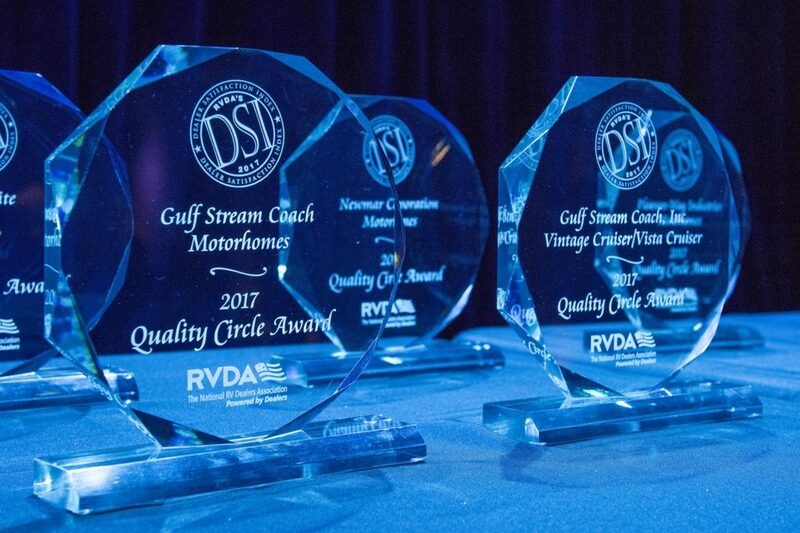 In a ceremony conducted during the National RVIA Show in Louisville the last week of November, the Recreational Vehicle Dealers Association (RVDA) recognized Gulf Stream Coach as the winner of two of the organization’s coveted DSI Quality Circle Awards, for our Vintage/Vista Cruiser lightweight travel trailers, and our Conquest Class C and BT Cruiser motor homes. RVDA member dealers submit secret ballots rating their RV suppliers on a scale from 1 to 5 in four key categories: Product Quality/Reliability, Parts, Warranty Service, and Sales. Manufacturers have to earn an overall average score of 4.75 or higher to qualify for the Quality Circle Award. It’s the highest recognition offered by RV dealers to RV manufacturers. That’s why we’re so proud to have earned TWO Quality Circle Awards this year, for our wildly popular Vintage/Vista Cruiser ultra-lightweight travel trailers, and our industry-leading Conquest Class C and BT Cruiser motor homes. It’s the second winning year in a row for the Vintage/Vista Cruisers. Also notable – The Gulf Stream Conquest was the only standard Class C motor home in the industry to earn the honor this year. The Quality Circle Award helps RV Dealers find products that will meet their standards for quality and reliability, before and after the sale. The Award also gives savvy consumers a way to find best-in-class RV’s, like winners from Gulf Stream Coach, the Vintage/Vista Cruiser travel trailers and Conquest Class C and BT Cruiser motor homes. This entry was posted in News on December 6, 2017 by pcampbell@gulfstreamcoach.com.